Putting lots of smart grid systems together can help keep power outages to a minimum. Here’s how PG&E is taking on the challenge. Pacific Gas & Electric has released a host of news in the last month that helps explain how a multi-tiered smart grid approach adds up to ever-increasing benefits in terms of one key function: finding and restoring power outages. Consider it one angle for examining how distribution grid automation and management is emerging as the new focus of utility smart grid projects around the country. PG&E is far from the first utility to combine smart meters, power line sensors, remote-control grid switches, communications and software in this fashion, of course. Utility spending on smart distribution grid systems -- the smart grid that lies between utility substations and customer meters -- is set to outpace spending on smart meters over the coming years, rising from $2.2 billion in 2010 to $5.6 billion in 2015, according to GTM Research. Bit given PG&E's role as a smart grid vanguard, it’s worth taking a look behind some of its recent announcements to see how they all tie together -- and how they, in turn, could lay the groundwork for other smart grid functions, like integrating rooftop solar power and fine-tuning grid voltages to save power. Here's a breakdown. First, we’ve got PG&E’s first test of its Cornerstone Improvement Program -- a $360 million project to smarten up 400 of its distribution grid circuits over the next few years. Earlier this month, an early-stage deployment of the system of high-speed communications, smart grid switches and control software was able to detect an outage near the town of Rio Vista, isolate the section of line where the outage happened, and direct repair crews to the spot in record time. Overall, the successful implementation of the so-called “Grand Island Scheme” cut the effects of the outage by 77 percent, compared to how the old system would have managed it, said Steve Calvert, senior manager in charge of the project. That included restoring most customers’ power within two minutes, he said. The key to faster restoration is a new communications system that allows PG&E to centrally control automated switches already deployed across its grid, Calvert explained. Those switches are good at dealing with grid problems based on pre-programmed settings, but tying them all together provides a lot more human oversight, as well as the ability to operate them in concert in an automated fashion, he said. Call it FLISR, or fault location, isolation and service restoration. About half of PG&E’s $360 million Cornerstone project will be going to such advanced tech (the remainder is for upgrading rural lines and transformer capacity), making it one of the larger FLISR deployments in the country. It’s hard to quantify the cost of power outages, although a report from Lawrence Berkeley National Laboratory (PDF) estimated that losing power can cost large commercial and industrial customers between $8,000 an hour for agricultural firms to about $47,000 an hour for manufacturing firms. Restoring power more quickly to Rio Vista’s 8,000 or so residents might not represent that much lost productivity, but Calvert noted many of the switches that Cornerstone will be improving lie in urban areas, where reliable power is much more cost-effective, so to speak. PG&E plans to name some of the vendors working on the project before the end of the year, but for now it’s keeping a lid on that info. Likely partners include grid giants such as GE, Schneider Electric, Siemens, ABB and Alstom. The next step in PG&E’s outage management plans came on Nov. 17, when the utility announced that its smart meters are (finally) capable of “last-gasp” outage alerts. Simply put, PG&E has enabled its 5 million or so electric smart meters to use battery power to send a signal when they detect a loss of grid power, right before they go dark. That’s a much better way to pinpoint power outages than waiting for customers to call and report it, which is still the way most utilities learn of them. Beyond that, smart meters can help enlighten the utility to the condition of the grid between substations and the 2,500 to 3,000 customers per average circuit, Kevin Dasso, senior director of transmission and distribution engineering, told me last week. The data flows into PG&E’s outage management software, which gathers it up as it already does for phone calls and plots it on a map to show operators the scope of the outage, Dasso said. From there, it can be fed into systems like the ones Cornerstone is installing to give them a clearer picture of where power is flowing and where it has been cut off. The costs of enabling this “last-gasp” function are part of PG&E’s $2.2 billion smart meter project, Dasso said. While utilities get most of their money back on smart meter deployments by getting rid of meter readers, the benefits of faster outage detection -- as well as the many other smart meter capabilities the utility wants to turn on over the coming years -- are wrapped up in the overall business case as well. Utility regulators, under pressure to get customer benefits out of smart meter deployments, are asking utilities to start turning on those capabilities and measuring their benefits. Utilities like Texas-based CenterPoint and Australia’s SP AusNet are starting to deploy it, but pretty much every smart meter deployment includes it at some point in the rollout. Silver Spring Networks, provider of smart meter networking for PG&E and other utilities, builds outage detection into its software suite. So do smart metering systems from competitors like Trilliant and Echelon. Indeed, Capgemini and Platts reported in June that utility executives reported outage management as the single greatest benefit smart meters could offer. Expect more on this in 2012, as all those stimulus-funded smart meters start to be turned on and put to the test. So PG&E is managing outages at major grid circuits with data sent out by dying meters. But there’s still a lot of space in between that’s “dark”: un-networked and un-sensored feeder lines, transformers, switches, capacitor banks and the like. Right before Thanksgiving, PG&E unveiled a proposal to spend about $109 million on six smart grid pilot projects, including a few that should help cover those dark spots in the grid. Line sensors -- devices that sit on a power line and report its condition -- are first on the list. 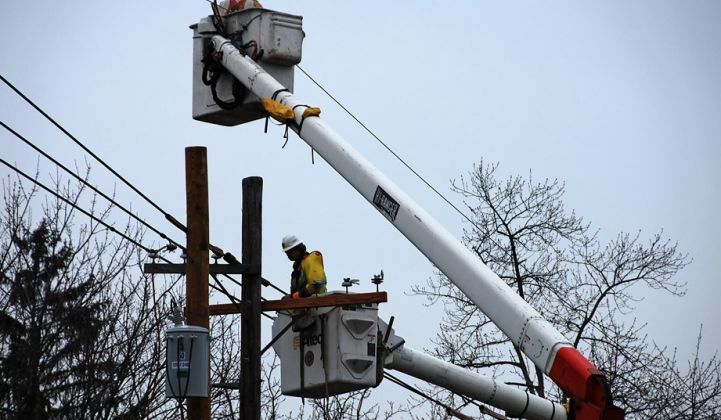 PG&E wants to install sensors on up to 30 distribution feeder lines, with each project involving about 10 or so sensors spread out across 40 to 50 miles of a circuit, Dasso said. Right now, “with Cornerstone, we’d typically break up our circuits into three or four sections,” he said, which will give the ability to quickly isolate the one-third to one-fourth of the overall circuit that’s lost power and restore the rest. Still, that leaves a big length of feeder line in the dark, so to speak. Line sensors break up that section into smaller chunks, which can help guide crews to the exact location of the fault -- a car crashed into a power pole or a tree that has fallen across high wires, for example -- that much faster, Dasso said. PG&E hasn’t named any line sensor vendors it’s interested in working with yet, since it’s still waiting for the California Public Utility Commission to OK the pilot, but companies in the space include the usual list of grid giants, as well as entrants like PowerSense, Sentient Energy and Power Tagging. But even, those short stretches of line between sensors may involve 4 to 5 miles of overhead and underground power lines that utility crews need to check out, Dasso said. To try to narrow the search even further, PG&E wants to test some new software “decision analysis” tools that can help tie its smart switches, smart meters and line sensors together, he said. “That would help us direct that field inspector on how to look for that problem -- more and more narrowing the location, and doing it as automatically as possible,” he said. That sounds complicated. PG&E hasn’t named any vendors it plans to use its grid analytics software, but big IT players like IBM, Oracle and Microsoft are working on that kind of stuff. So far, PG&E has laid out a pretty complete vision for seeing where power is on or off. What about managing the quality of that power? To that end, PG&E is proposing a voltage and grid control pilot, aimed at increasing line efficiency, optimizing grid operations and integrating renewable resources like rooftop solar into the mix. Utilities have to keep the voltage of power going to customers within a specific range, typically between 126 volts and 114 volts in the United States, Dasso said. Today’s systems use devices such as load tap changers and capacitor banks to maintain that voltage range, and “they’re manually set, generally for the highest conditions and the lowest conditions -- it’s more or less set it and forget it,” he said. Smart voltage regulation, on the other hand, remotely controls devices to sense what the true voltage is on a circuit and adjust it, mainly to keep it as low as possible. Lower voltages means more efficient use of power by most of the devices that use electricity, and thus lower power bills. That’s called conservation voltage reduction (CVR), and utilities are using it to squeeze efficiency out of distribution grids in the low single-digit percentages, which is a lot when applied to an entire utility’s power demand. Better grid voltage controls can also help cushion the destabilizing influence of rooftop solar panels, which feed varying amounts of power onto the grid. PG&E has more solar customers than the rest of the country’s utilities combined, and while it hasn’t reported any problems with managing that input yet, it is likely to face the problem sooner rather than later. Once again, PG&E has only proposed to pilot this kind of technology so far, so it hasn’t named vendors it might work with. Indeed, another one of its proposed pilot projects involves lab testing different vendors’ hardware and software to see which offer the most effective and cost-competitive products, Dasso said. Indeed, the list of vendors with such distribution automation (DA) and distribution management system (DMS) offerings keeps growing, as does the list of utilities trying them out. PG&E is looking at late 2012 to hear back from state regulators on whether it can move forward with its pilot projects. In the meantime, we’ll be covering the onslaught of acronym-based smart grid projects everywhere else.